Type of Object Molded glass. Overall Condition Good to Fair. 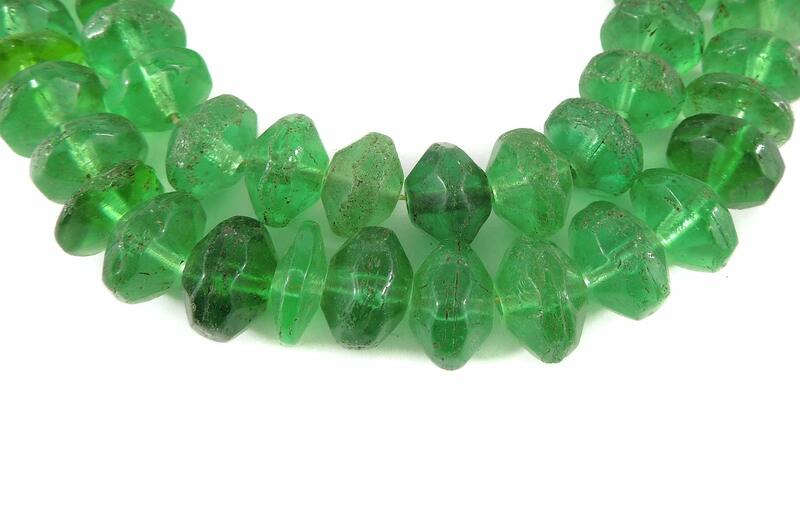 These beads have traveled at least three continents, and have graced numerous owners. Small chips, corrosion, and pitting are a normal part of their patina attesting to their age and extensive use. Bead Size 14-15 mm diameter. See picture with penny for size comparison (US penny is 19 mm diameter). Additional information: Vaseline Glass - The term "Vaseline glass" loosely applies to a process where uranium is added as a chemical agent to glass. 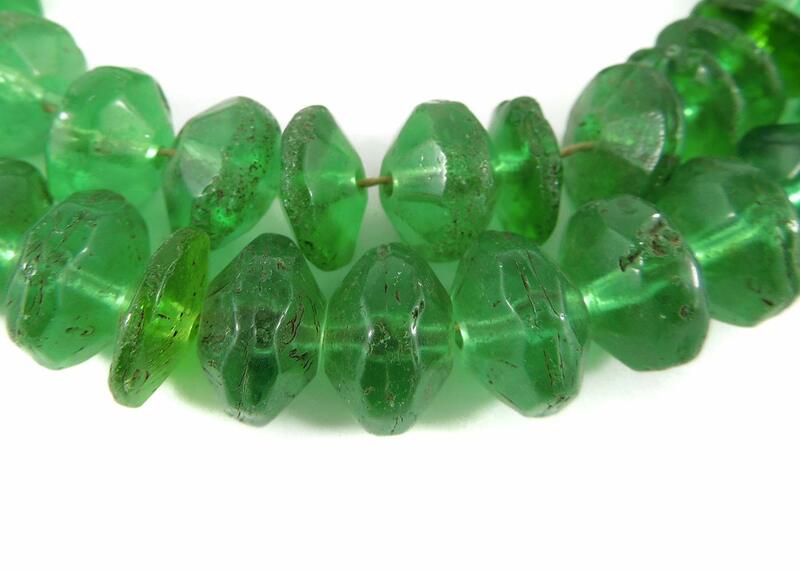 These are not uranium vaseline glass, but their shape is the same, and they are commonly known as "vaseline beads." During the early 19th century glass makers in Central Europe started to use uranium as a good way to make yellow and green glass. When added to glass, usually as an oxide, uranium produces colors varying from amber, all the shades of yellow, bright apple green and when added to a glass mixture with very high lead levels produces a deep red color. During the latter part of the 19th century some glass with uranium was made with heat sensitive chemicals which turned milky white when reheated producing a shading effect from yellow to milky white. Glass made with this particular process was named" Vaseline Glass" because it resembled Vaseline ointment which at the time was a yellowish color.All colors of glass with uranium will fluoresce beautifully when exposed to ultra-violet light. Vaseline glass beads are usually a small bicone shape with eight facets on either end and vary in colors from yellow through to red. Most of these were produced in Europe in the mid to late 19th century. During this production period the beads were hand faceted and had conical perforations. 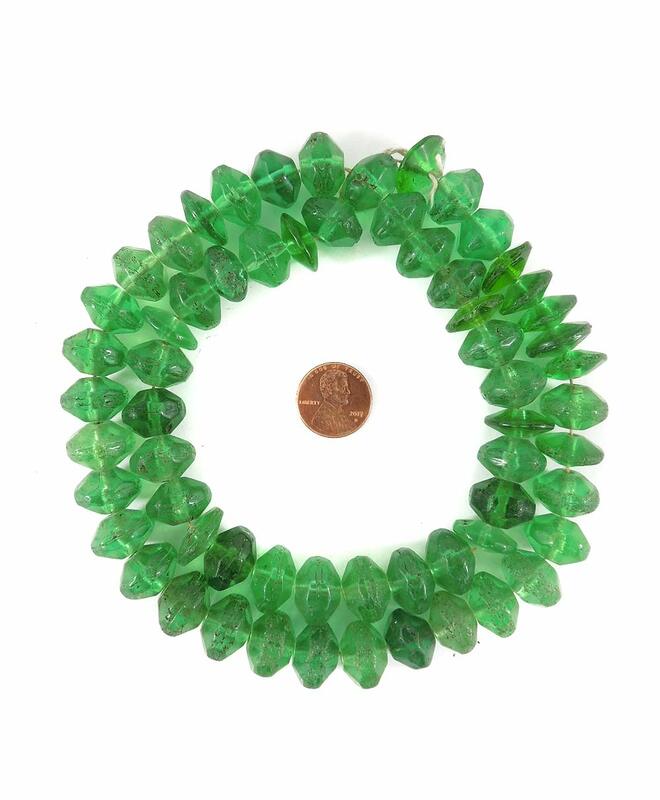 There was a revival period of "vaseline" style beads production in the mid 20th century and the beads pictured here are from that period. . You can also see "vaseline" glass used in vases, compotes, bowls, candlesticks and other utliltarian pieces. Recommended Reading: Picard's VOLUME V, RUSSIAN BLUES, FACETED AND FANCY BEADS FROM the WEST AFRICAN TRADE.